Long before Jim Cramer’s record was being dissected, Alfred Cowles was skeptical of the claims made by stock market pundits. 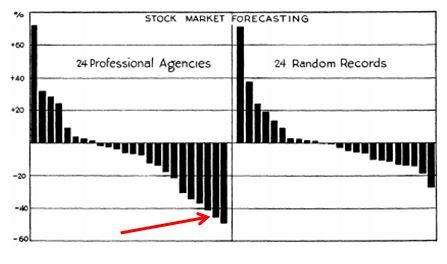 Cowles, who later founded the Cowles Foundation for Research and Economics, spent years working on a paper published in 1933, “Can Stock Market Forecasters Forecast? It appears that their abilities were no better than random. Of course we know that people claiming to consistently time the market are lying either to the public, or to themselves. But what usually gets lost in this type of analysis is that one does not need to make these sort of predictions to be a successful investor or to have an effective risk management strategy. In fact, I would argue that more active market participants would be the first to say that making directional calls is mostly a waste of time and energy.